SAN FRANCISCO -- The San Antonio Spurs pushed their season-best winning streak to 17 Saturday night, beating the New Orleans Pelicans, 96-80, at the AT&T Center. Marco Belinelli came off the bench with 18 to pace the Spurs while Manu Ginobili and Kwahi Leonard each had 15 points for the Spurs, who fortified their lead of the overall standings with 57-16. Tim Duncan also turned in a fine effort with 12 points, eight rebounds and six assists. The Spurs jumped to a 28-15 first quarter lead and never looked back the rest of the way. They led by as many as 22. "We played really well tonight so they couldn't get over the hump. They have a lot of guys missing and I'm really impressed by them," Spurs head coach Gregg Popovich told NBA.com after the rout. The Pelicans dropped to 32-41 in the standings. 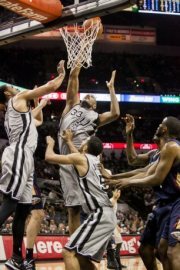 Photo: A bevy of Spurs chases after the rebound in San Antonio's victory over the Pelicans Saturday night.